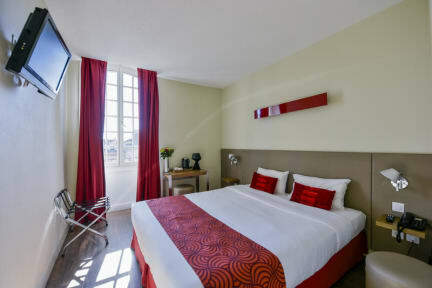 Completely renovated in 2011, the Coeur de City Hotel Bordeaux Clemenceau is a beautiful and comfortable hotel ideally located in the city center, near a pedestrian area. 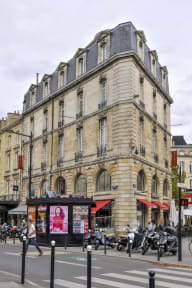 The Cœur de City Hotel Bordeaux Clemenceau is ideally located in the historic centre of Bordeaux, world capital of wine and a World Heritage Site by Unesco. The hotel is an eighteenth-century edifice that is full of character. The whole team is at your disposal during this time so that you can fully enjoy your stay. A breakfast buffet is available daily until 9.30 am or 10 am during the weekend. The property offers free Wi-Fi internet access. The Coeur de City Hotel Bordeaux Clemenceau offers a privileged location in the Golden Triangle of Bordeaux, close to Place Gambetta, where you can easily reach the many pedestrian streets, shops, museums and you can easily discover the architectural treasures of the city district of Great Men Place Quinconces, the Cathedral, the Grand Theatre, Quays. The Cœur de City Hotel Bordeaux Clemenceau has reopened its doors in early 2011 and offers 45 rooms fully air conditioned and decorated in a style 'design': free Wi-Fi, LCD TV, satellite TV, private bathroom, and reception 24 hours a day. All rooms are soundproofed. Please note: Rooms for 2 people; if you have any preference do not hesitate to let the hotel knows if you would like to book a double room or twin room. Payment types accepted at this property: cash, credit card. Taxes not included - Local occupancy tax 1.10 euros per person per night. Please note: from 2016 local tax will: 1.35 euros per person per night. Breakfast not included. Extra-cost: 11 euros per person per day. Breakfast is served from 7 am to 9.30 am. During the week-end till 10 am. Pets are allowed at this property. Only small pets are accepted. Child friendly. There is no capacity for extra beds in the room. The maximum number of cots in a room is 1.